2-3 £123.53 ea. 4-7 £122.28 ea. 8+ £121.03 ea. 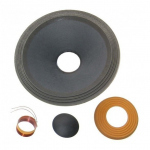 Beyma Recone Kit for 15G450N 8ohm. This is what you need to repair a blown driver.